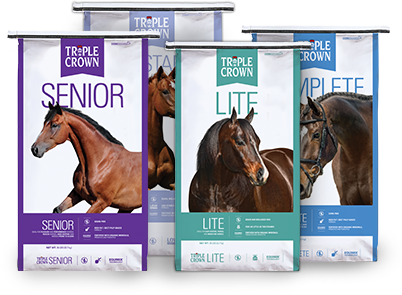 If you are looking for the most nutritionally advanced feed for horses, Triple Crown feeds are beyond compare. Triple Crown horse feed has been providing leading-edge equine nutrition for over 30 years with its premium ingredients, fixed formulas and EquiMix, a proprietary blend of digestive aides and live prebiotics and probiotics for nutrition that goes beyond expectations. Choose one or more feeds, then click to compare to Triple Crown. Surprised? We aren’t. While many companies use the same ingredients as Triple Crown, only our fixed formulas offer the proper levels of quality nutrients for a superior feed. As a thank you for comparing your feed today, simply fill out the form below and we'll send you a coupon for $5 off any bag of Triple Crown Feed. *One coupon per household. It’s clear all Triple Crown feeds offer superior nutrition, but choosing the right feed can be tough. It requires assessing your forage quality, your horse’s needs, and your own preferences, such as non-GMO or soy-free ingredients. Contact us to help you find the right feed. Call 800-451-9916 Monday through Friday 8am-5pm EST. Click here to email us.